Some would say that the genre of street photography stems from the existence of shots taken by the likes of Henri Cartier Bresson, which depict an experience of World War II. These days street photography takes on an art, which exceeds photojournalism, because all the ironies and messages hidden in humanities facades are exposed by the cleverness of a lens. 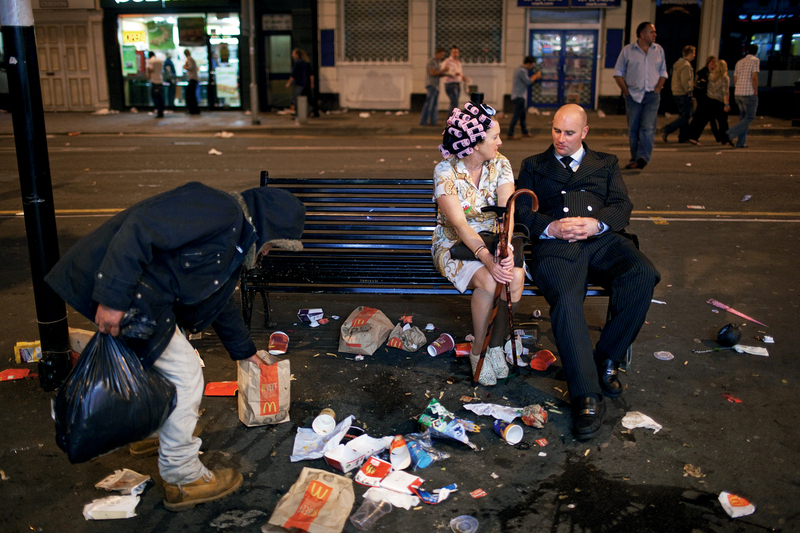 A current successful street photographer is Maciej Dakowicz, who took to the streets of Cardiff, Wales. Maciej blended in with Cardiff’s nightlife, and what he found was the truth about our binge drinking culture. Without the haze of tequila and the protection of Jack, the camera caught the grotesque behaviour and excessive waste and consumerism belonging to a night out on the town. It was the truth that belonged to street photography, which motivated me to pursue my own experiment. In my second year of university I joined a photography evening class, to help me get to grips with the new Canon 60D I had bought during the summer holidays. I thought it essential that good equipment and knowledge of photography would help me to get those all-important street shots, I was wrong. Although I’m pleased to have attended those classes I found that when I marched my way around the streets of London, the big bulky camera I held in my hands was an instant liability in my experiment. I wasn’t invisible enough, and to achieve this level of invisibility I purchased throwaway film cameras instead. If I finished university early, or had a free weekend I’d jump on the tube with about four small cameras in my bag, and proceed to take pictures of everything that I believed reflected the pulse of London. The journeys I took opened my eyes to human behaviour. It is so easy to pass by phenomenal occurrences in London, because of the focus we have to get passed the crowd to our destination, like human sat navs that don’t understand if a person blocks the path of turning left, it’s not ok to proceed anyway. I can tell you that what I saw was aggression, carelessness and cruelty. Despite this negative side of London, I also found serenity, kindness and beauty. I met people on my travels, complete strangers who I would never have spoken to if my mind belonged to the determined commuter, or angry businessman. The small throwaway cameras taught me to be selective of the images I took. One image I will always cherish is that of a middle-aged Chinese woman in Trafalgar square. In the centre of hustle and bustle she laid out her yoga mat and started to perform the movements of ti chi. I was amazed that someone would so feel comfortable and trustful of London. The other image I’m fond of is of three statue performers from Covent Garden, that were on their lunch break, silver, gold and bronze all eating sandwiches. So my advice is that instead of instagraming your meals, or taking pictures of the London Eye, buy a throwaway camera, and learn the art of street photography through that. You might not get images as notorious as Cartier Bresson, but you will learn about the diversity and wonder of places and people we all take for granted everyday.